This afternoon I'm drinking Supplication brewed by Russian River Brewing Company in Santa Rosa, California. This will be the first beer I've had from this brewery, and let me tell you that I am extremely excited considering all the attention this and most of their beers get. This one came home from my friend's Denver business trip last week. Thanks again. 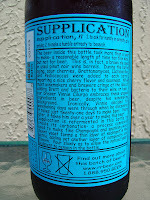 Supplication is a brown ale aged in oak pinot noir wine barrels for 12 - 15 months. 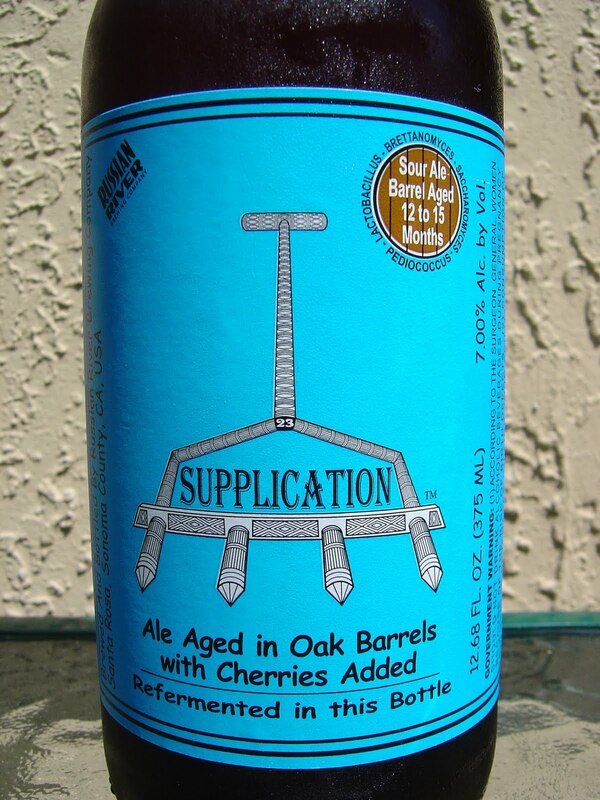 During this aging process, Brettanomyces and other bacteria along with sour cherries were added, and the beer was finally refermented in its mini half-wine-sized corked bottle, 375 mL. My Batch is 005X3. I think it was like $13 so I'm expecting a lot! Sour fruity aroma with an unmistakable cherry component. Also a white wine, chardonnay-type smell. Wow! Sour cherry flavors right out of the gate. This is so awesome and way more intense than I even imagined it would be! Tart Granny Smith apples and sour grapes just keep pouring on the flavors, taking continuous jabs at my palate. At the same time there seems to be a lightly soothing sweeter fruity component, perhaps pears, but that is subtle at best. 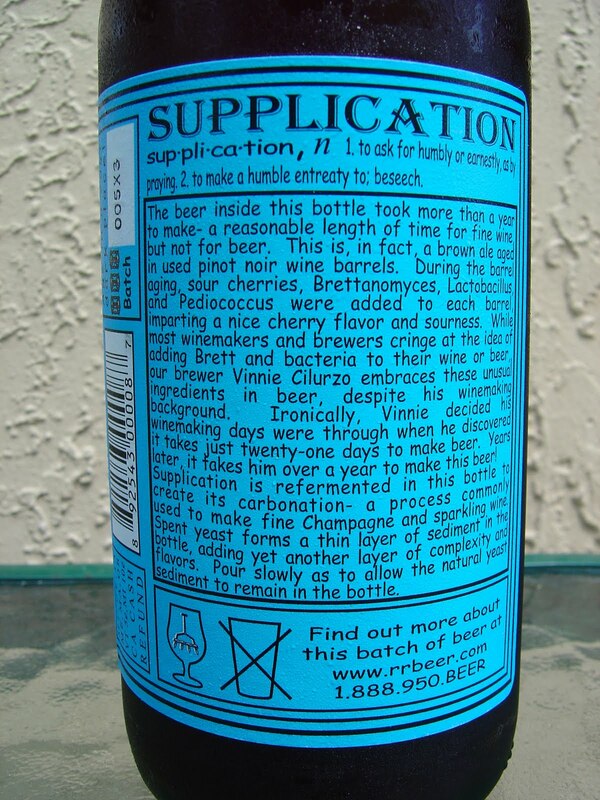 The wine quality of this beer is pretty amazing too, with sharp and biting acid. Finally, that Brettanomyces provides a hint of funkiness which works oh so well with the sourness. 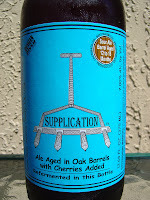 I also loved the solid carbonation which really intensified the sour grape and cherry flavors. Complex and delicious! Try it when you can and get another for later, even at its price! Robert Mondavi by Waterford Pinot Noir, Pair, 26 oz. Glad to see you liked it! It is an amazing beer. Russian River does a slew of great beers so you'll have to do a trip out here so you can try them all. But their sours are some of the best in the US that I've had. I've only been to California once, and that was a layover at LAX on the way to Tahiti. So yeah, I really am due for a trip out west and can't wait to try all the beers available. My first beer of russian river i tasted, was a pliny the elder and wow! amazing! may be the best ipa i ever tasted in my hole life jeje. Yesterday i saw this bottle, but bringme another beers, next week definityly with your descriptiion i bought it, no doubt it. Excelente blog! Regards Hoppy Week! This was the first RR beer I had. Since this review, I've had several more, including Pliny the Elder. 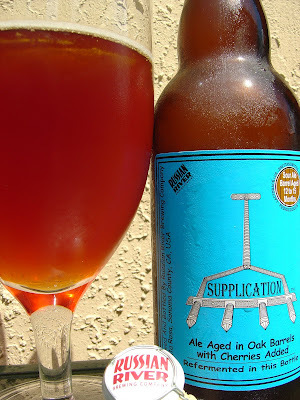 This may still be my absolute favorite though, and it was my favorite beer for the entire 2010 year!